Porcelain and Neon Signs are our identity. We have an extensive collection of Porcelain and Neon antique signs. We deal in buying, selling and collecting all types of Porcelain Neon signs including automobile, plane, truck, car, train, etc. Oil and Gas signs include Shell, Mobil, Texaco, Cities Services and various others. If you are a soda enthusiast and want to check-out the rich history of existence and evolution, then Redhot-Roadrelics is the perfect destination for you. You can get signs of RC Cola, 7-UP, Coca-Cola, Pepsi, etc. Breweries and Beer companies signs are an essential part of our collection. You can get signs of brands like Budweiser, Kato, Grain Belt, Hamm’s, Point, Schmidt, Blatz, etc. If you are someone who believes in digging the history, our gate is always open for you. Not only will you update your knowledge, but it also gives a chance to see our whole collection. Our old collectible signs range from 1800’s to 1940’s. You have the opportunity to sell or buy any types of neon signs. I am always behind you, helping you get the best out of how much you spend. Our porcelain signs highlight the vibrant and traditional art of older, simpler times. Our range includes signs from those eras when gas stations were in full swing and coke bottles used to cost a nickel. 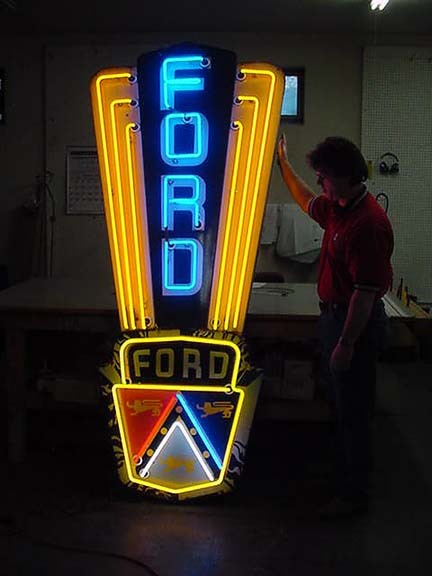 Our categories and collections of vintage neon and porcelain signs are endless. In my 30+ years experience, I have come across numerous collectors and their unusual buying and selling pattern. A few of them stick to a specific style or brand of signs. While the others collect all that comes their way. On the other hand, I differ from the other collectors in a variety of ways. Like, I prefer to focus more on the rich heritage and antique significance of signs before I make any purchase. If you ask me the one sign which is famous among all, then I will go with Coca-Cola Porcelain signs. People go crazy for the Coca-Cola signs. Being among the first companies to expand globally, Coca-Cola introduced various signs in many shape, sizes, color, and material. Each sign carries a tradition and heritage of the company from the last hundred or more years. If you have any requirements for selling or purchasing any vintage signs or Porcelain neon signs, then we are the first name that comes to the mind. We have never tried marketing. However, our customers are the best medium of advertisement. We solely rely on mouth advertisement and that makes us different from the rest of the crowd offering similar goods and services. Of all the signs of our collection, many come in distinct shapes and sizes, forms and styles. Some have to go through the tedious process of die cutting with numerous colors of Porcelain and Neon. Auto and Transportation enthusiasts can get a lot from the store. Signs of Ford, Chevrolet, REO, Oldsmobile, Nash, Buick, Pontiac, Hudson, Peterbilt, Mack Truck, Cessna, Evinrude, Zephyr, Greyhound, Hiawatha, Burlington Northern, etc. To know more about the signs and collections, have a virtual tour of our gallery by clicking here.